When it comes to digital cameras, Canon would be thought as one of the top three brands for its powerful products. In photography life, you may accidentally hit the delete button or format the memory card on your Canon camera, only to find that some of precious photos or videos have not yet been backup. Therefore, it’s very important for Canon camera users to learn about how to recover deleted photos or videos from Cannon cameras like Canon EOS, IXUS, Powershot. 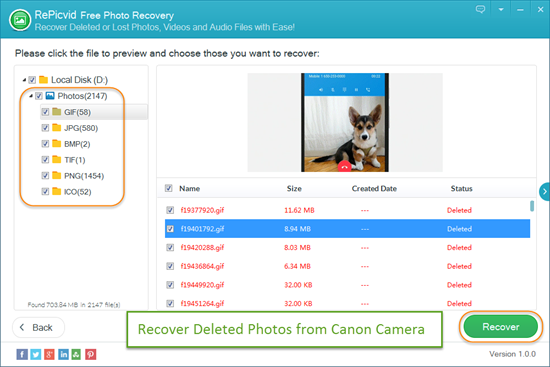 Why Deleted Pictures Are Recoverable with Canon Photo Recovery Software? No matter you delete photos from Canon or format its memory card, the deletion or formatting function does not really erase the data immediately. This means the lost pictures/videos, though invisible, remain intact unless you write new photos/videos to Canon memory card. So you’d better stop taking more photographs but get a Canon Photo Recovery tool to get access and recover deleted pictures from Cannon camera as soon as possible. As explained above, Canon photo recovery stands a good chance if the deleted pictures/videos are not overwritten. 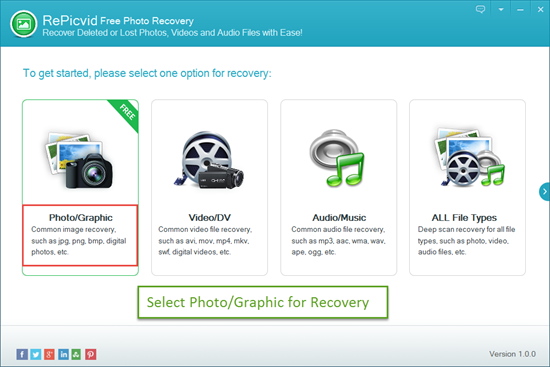 In this case, RePicvid Free Photo Recovery, a specially-tailored recovery tool for Canon, would be a great help for you to recover deleted photos from Canon camera for free. It supports all Canon camera models such as Canon FL/EE/FD -mount SLR, EOS, PowerShot A/D/E/G/N/Pro/S/T series, etc. Special image formats of Canon camera like CRW, CR2 are also supported to be restored. In the primary window, choose the “Photo/Graphic” (or Video) recovery option. And the Canon memory card will detected by the software after connection. Then start to scan all deleted pictures/videos in the memory card of camera. It may take several minutes for wait. After scanning, preview deleted photos/videos and check those you need. 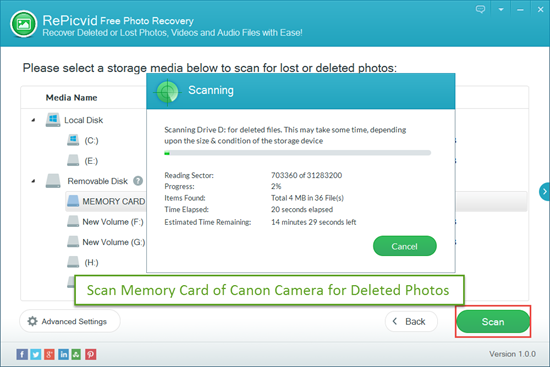 Click “Recover” to restore deleted photos and videos from Canon camera and choose a folder to save them. Stop using the camera to take more photos or videos the moment you found the files were deleted or lost. Also avoid saving new files onto Canon camera card. If your Canon camera memory card can’t be recognized by the software, just check the tips of how to recover deleted files from memory card. In last step, don’t save the recovered photos to the memory card of canon camera again.